FAQ | Central Coast Senior Services, Inc.
Because every situation is unique, the cost of care can vary greatly and change over time. You may need only a single two hour visit every week, and then circumstances change and you suddenly need 24/7 care. You can be sure that no matter what level of service is appropriate, our in-home services always include comprehensive case management from our professional Home Care Managers, as well as 24/7 access to a Home Care Manager and a Staffing Coordinator. We encourage you to contact us for a free, no-obligation consultation to discuss your needs and budget at 831-649-3363. Are your services covered by Veterans Affairs or MSSP Program? Veterans Affairs will pay for In-Home Care and Adult Day Care for qualified veterans. Central Coast Senior Services, Inc. is proud to be a contracted provider with the VA for both In-Home Care and Adult Day Care. To learn more click here: VA Home Health Services. During our free consultation we will be happy to help you understand the overall process to apply for VA benefits. MSSP is a program of Health Projects Center (click to learn more). This program offers free social work and nursing services to medically isolated, frail and underinsured older adults who are at risk for premature institutionalization or loss of independence. MSSP provides care management services to assist clients with daily living needs so that they may live healthy, active lives. Central Coast Senior Services, Inc. is a contracted provider of Respite Services to allow the primary caregiver “time off” from their often constant caregiving duties. Are your services covered by Medicare, Medi-Cal, or private insurance? Medicare considers home care “non-medical custodial care” and unfortunately does not pay for Long Term Care such as Home Care Services. Medicare does pay for Home Health Care and in some circumstances visits from a Home Health Aide to help with personal care. During our free consultation we will be happy to help you understand what your benefits cover. If you have a Long Term Care Insurance (LTCI) policy, it might cover home care. LTCI polices have several areas that need close attention to include: Daily benefit, elimination period (waiting period from when you make a claim and when the policy will begin to pay), and lifetime benefit. We have found most policyholders wait too long before they use their benefit treating LTCI like other insurance (homeowners, auto) for which you typically never want to file a claim. LTCI is different. We can help by reviewing your policy and if needed contact your insurance company on your behalf to confirm your benefits. As a client we provide your LTCI carrier with the documentation necessary for reimbursement. Individual or commercial group/employer based health insurance typically does not cover Home Care services but usually will cover on a limited basis Home Health Care services. Call us to set up a free consultation with our Home Care Coordinators to explore your coverage and benefits. How long does it take to get services started? We can usually get started very quickly. The initial process includes a visit from one of our Home Care Managers in your home, hospital or skilled nursing facility to perform an assessment and develop your plan of care. Then our Staffing Coordinators will find the right Personal Attendant for you. Registering for our Reserve Care Program allows the admission process to go even more quickly: with your information already in our system, we can start service with just a phone call. Learn more about Reserve Care ™. How do I know your caregivers will take good care of me or my parents? We pride ourselves on having Personal Attendants who provide compassionate and professional care. Our employees undergo an extensive hiring and training process (Our Training), including a comprehensive background check and up to six days of mandatory paid training. Our Management Team works to ensure that each client is matched with compatible Personal Attendants with the necessary skills and knowledge, and our Home Care Managers make regular supervisory visits to the home to update the client’s plan of care. Our Staffing Coordinators always do their best to make a good personal match. We understand that in your own home you must be comfortable with the people assisting you. If you are not comfortable with your Personal Attendant, your Home Care Manager will work with you to resolve your concerns, which if necessary may include replacing the Attendant. Why shouldn’t I just hire a private attendant myself? Hiring a caregiver comes with a number of responsibilities. To begin with, of course, you will have to manage the hiring process, conducting interviews and background checks, and once hired, you will have to manage scheduling. When a caregiver works in your home privately, you will typically be considered their employer. His or her payroll tax obligations falls to you as the employer. This can be a serious obligation because it may involve back payroll taxes with interest and penalties, civil fines and for failure to discharge your employer duties. 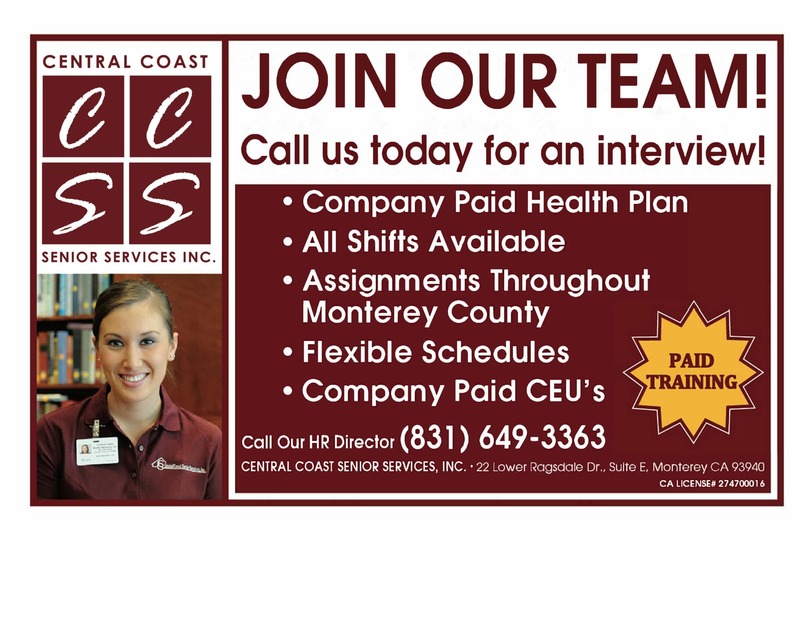 When you work with CCSS, we take on all the duties and responsibilities of being an employer, as well provide the training, management, and support that Personal Attendants need to do their best work. What regulations affect home care agencies? The Department of Social Services’ Home Care Services Bureau manages the licensing of home care agencies in the State of California. While licensing requires five (5) hours of training, Central Coast Senior Services, Inc. prides itself on providing approximately three days of classroom paid training. We encourage you to closely question any agency you consider regarding their training requirements. Learn more about our Care Philosophy and Standards of Excellence and our employee hiring and training policies.